Create your workout calendar with iKeepActive! Sync to your Mac’s calendar which can then sync to your music player, phone or tablet*. iKeepActive is an integrated activity scheduling system which also interactively counts Calories. Not only does it help create your activity schedule but its primary focus is to make sure you do them by displaying reminders and follow-ups. You can also use it to log your diet, analyze your progress and visualize your results. In spite of the fact that there’s nothing but colder weather ahead for the next few months in the northern regions of the world, it’s important to replace your outdoor activities with winter sports or at least some gym time. And while you might think a little bit of winter fat might help keep you warm, it probably shouldn’t be a goal, especially if you gain more than you can lose. How many people do you think will subscribe for a gym membership next January, and how many do you think will still be going by March? The answer: lots, and much less. On that note, there’s no time like the present and presently it is the perfect time to start (or to keep going if you haven’t yet stopped). If you, like me, are among the subset of an already smaller group of people who have continued to cycle to work in November, make sure to keep safe. It gets dark outside earlier so don’t depend on your reflectors for cars to see you; get something electronically powered. Now I’m guilty of donning a toque instead of a safety helmet, but what you should really do is find a creative way to keep your ears and face warm while wearing your safety gear. So besides my advice, how else am I helping you for these fall and winter months? Well, there are new and improved versions of Foods and Moods and iBodyFat waiting for review in the Mac App Store as we speak, meaning they should be available within the next two weeks or so. I have also began work on the next version of iKeepActive, so stay tuned! The lastest update for iKeepActive fixes the issue with the Calendar app not being able to run iKeepActive when your scheduled activities are due on their calendar date, a limitation introduced in Mountain Lion. This version also supports previous versions of OSX, Lion and Snow Leopard. Some new features were also added. This update has been waiting for approval from Apple’s app review team for nearly four weeks now. Until then, iKeepActive remains voluntarily withdrawn from the Mac App Store, unfortunately even for potential customers on earlier versions of OSX who would not be affected by the issue. Apologies go out to all iKeepActive users who have upgraded to Mountain Lion, who have been suffering from this issue since July. 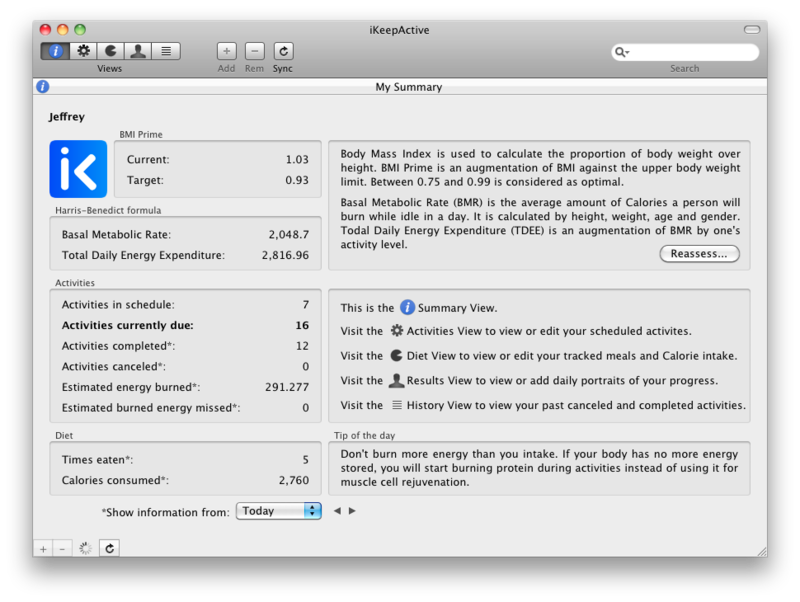 The first 10 eligible Twitter users to publicly tweet #giveaway @iKeepActive and provide a link to these rules will receive a free copy of iKeepActive, the workout scheduling and calorie counting software for Mac OSX. If you don’t own a Mac, then win a copy for your friend. The eligible participant must be following @iKeepActive on their Twitter account (in order to receive a private message containing the promo code). The promo code must be used within 30 days; after that it is invalid. *Note that in order to use your Mac App Store/iTunes account for the first time, Apple may require your credit card information. This is will not charge you for redeeming the free application, but to link your App Store purchases the same way that your iTunes purchases are linked. Be rest assured that iKeepActive has absolutely no access to your credit card information; this is used only by Apple. If you don’t already have an active Mac App Store account, and are uncomfortable giving Apple your credit card information, then you are advised not to participate in this contest. The contest ends when the 10 qualifying winners are chosen, or when the promo codes expire. The end contest notification will be posted on the same date on iKeepActive.com and on Twitter by @iKeepActive. If you plan to resell the prize, you are in violation of Apple’s App Store terms for promotional codes and accept any consequences thereafter. You are below the legal age to use Twitter or an iTunes account. Multiple tweets about the contest will be ignored; only one prize per Twitter account. Posing/Pretending to be an official representative of the iKeepActive software. You are suspected of having used multiple Twitter accounts to participate in the contest. Suspicion that your Twitter account was opened for the purpose of entering the contest. This may include the account having been created in the last 24 hours, no legitimate tweets from the account prior to the contest date, or an account which has less than 10 followers. The Twitter account used for participation is used primarily for Spam.